You rely on your contact lenses to provide crystal clear vision that you can wear daily. However, contacts require careful maintenance to prevent protein buildup. Proteins are naturally found in your tears and can bind to your contacts, according to Contact Lens Answers. You may notice the protein deposits on your contacts as a thin haze on the lenses. While you may utilize a contact lens solution to store your contacts, you must use a specialized protein removal solution to remove protein deposits. 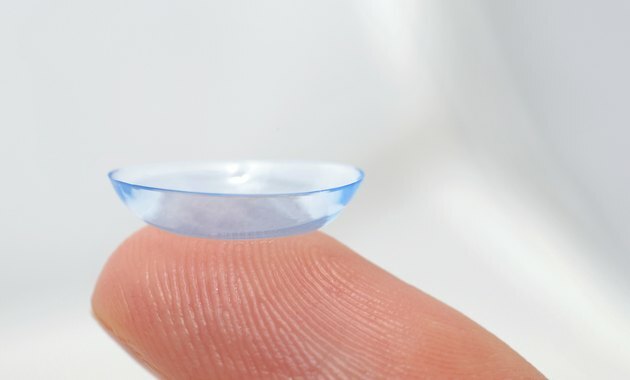 Knowing this technique is beneficial for both soft and hard contact lens wearers. Wash your hands thoroughly with an antibacterial soap. This helps to prevent any dust or bacteria from transferring from your hands to your contact lenses, according to Contact Lens Answers. Dry your hands thoroughly. Close the contact lens case or protein basket tightly to prevent liquid from leaking out. Shake the lens case for half a minute to ensure the solution fully coats the contact lenses. Allow the lenses to soak as recommended — typically two hours' time. Remove the contact lenses from the protein cleaning case and rinse with a multi-purpose or saline lens solution, according to All About Vision. Check the contacts for bubbling after you have applied this solution and continue to apply until you note no bubbling — this signifies that there are no longer protein deposits on the contacts. Continue by either putting in your contacts or storing them in your typical solution. Using a multi-purpose contact solution can help to remove protein buildup on a daily basis, according to Web Health Centre. If you experience regular eye infections or have concerns about protein buildup, be sure to clean the contacts weekly with a protein removal solution. Failure to remove protein deposits on your contacts can lead to serious eye infections and other eye complications, according to Web Health Centre.